It's Garage Sale Saturday! 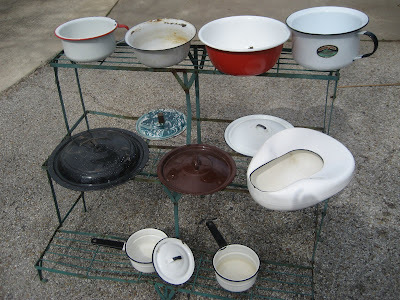 Can you say enamelware? Need a lid collection? Pots? Pans? Chamber pot? Bed pan? Ready to peruse? Come and get it! Click here and start looking. If you want to buy something, or ask me questions, or if you'd like to request measurements or more pictures, or whatever, please email me at PrimitiquesNPoetry@yahoo.com. If you tell me you want something, I will mark it SOLD on the flickr page so that others will know. The fine print...my mother does my packaging and shipping with USPS. I've never sold to Canada, but, I imagine we can figure that out. Let's keep this to US and Canada buyers. Mom uses Priority Mail shipping, as boxes are provided and it gets the package to you fairly quickly. So, after you have made your selections, Monday I will take them to her house and she will package and figure the shipping. I will then invoice you via Paypal. If you have questions or want more pictures, please inquire. You will want to click on the flickr set to see all the pictures and the prices. But, here is a sneak peak at some of the listed items. It is all Cheap Cheap Cheap this week! I need money and I need more room in my garage. I need to start having a Garage Sale of my own too! Have a good weekend! Mindy--Thanks so much for answering my question--funny because I sat it in front of a chair and told my hubby it made a great footrest. I have such a fondness for enamelware, but have slowly been "outgrowing it", and adding it to projects that I sell. 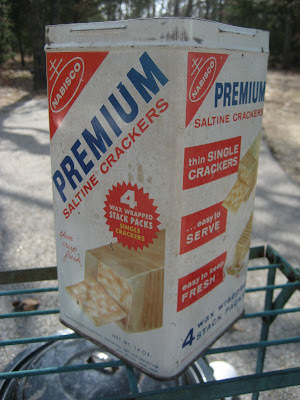 I just had to smile at the bedpan.....and the metal saltine tin.....used to collect those! But hey...I've collected everything at one time or another! Cool stuff girl! Thanks for a great weekend, Valentine! XO! 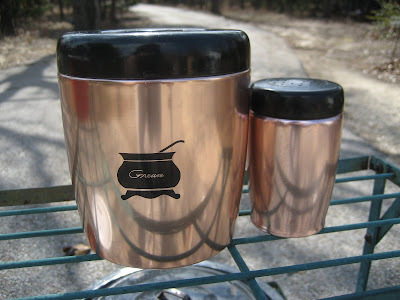 Mindy, those coppery canisters remind me of my grandmother's. I can just imagine what a walk through time your cute shop must be. Signs of the Times - Garage Sale! What is your Favorite Part?